The Cliff Hart Agencies, a Michigan based firm that provides insurance management services and financial consultations to families and businesses throughout the state, is focusing on east Lansing for a regional charity event to raise donations benefitting the Lansing Football League. 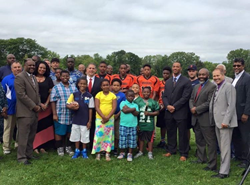 Currently serving more than 700 families in and around the Lansing area, the Lansing Football League provides young people in the region with sporting events, mentoring, physical development programs, and wellness education as well as career and college exploration opportunities geared toward underprivileged families. “The Lansing Football League is about much more than sports – here, children learn about health, fitness, and teamwork as they develop the skills necessary to succeed scholastically and in life,” says Cliff Hart, principal agent and owner of the Cliff Hart Agencies. By connecting with local families, educational professionals, and business associates over a network of email and social media channels, Hart and his team are gathering broad support for the Lansing Football League charity event. Additional efforts to raise public support will include a cover article detailing the charity event scheduled for publication in “Our Hometown,” a statewide monthly web-based magazine hosted by the Cliff Hart Agencies: http://www.cliffhartagencies.com/Our-Hometown-Magazine_41. Well over half a dozen notable charitable groups and nonprofit organizations in communities throughout Michigan have received assistance from the Hart team over recent months. Cliff Hart Agencies is a proud affiliate of a national charity support web called “Agents of Change,” and plans to continue working with new charities on a bimonthly basis. All those who are looking for more information on the Lansing Football League regional charity event are personally invited by the Cliff Hart Agencies team to help raise local support by following this link and taking action: http://www.cliffhartagencies.com/Shaping-Underserved-Youths-Lives-With-Football_23_community_cause. Previous charity drives sponsored by the Cliff Hart team are discussed on the firm’s Community Causes page: http://www.cliffhartagencies.com/community-cause.